Some runners choose their races based on distance. Or notoriety. Or the terrain, the location, the cause, or maybe the color of the T-shirts. I didn’t choose to run New Bedford for any of these reasons. I chose it because it was an official “Boston Marathon” team run for our Alzheimer’s Run for the Memory team. I also signed up because I checked the weather on my iPhone and saw a big yellow sun icon for Sunday. The 11:00 am start didn’t hurt, either. What I didn’t know was that the New Bedford Half Marathon is 33 years old, is the premiere half marathon in New England, and has been chosen by the USA Track and Field New England chapter as one of the seven “Grand Prix” races. And that this high-profile race attracts world-class runners from all over. We meet up at the YMCA to pick up our numbers, and I find my teammates and a port-o-potty pronto. 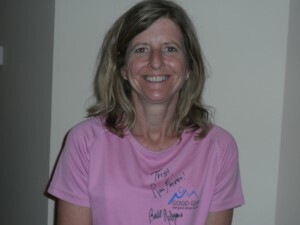 I’m wearing my lucky Good Gear 100% bamboo shirt made by my friend Danielle Pryor’s company, and signed recently by Bill Rodgers (“Run Forever, Trish!”). I’m ready to go, without knowing what I got myself into. I head up to the start, and find my teammates Jamie, Jocelyn, John, Ed, Mike, Paul and others, and we’re off! We hit an uphill at Mile 3, and that’s when everyone around me starts talking about the “Heartbreak Hill” at Mile 12. Hmmn. I store that away. Save myself for the killer-whale-of-a-hill at the end. In the meantime, though, the course is great. It’s fun, and the crowd support is awesome. I am completely enjoying myself, the crowds, the day. It’s all good. It’s OK. So, math isn’t my best subject either. Then, right before the rumored hill, I see a priest outside a Catholic church, running up the sidewalk with (I’m guessing) a runner-parishioner, his Kelly-green vestments flapping like angel wings. He runs for a few minutes, then heads back. By then I’m gone, but I feel all prayed up for the hill ahead. It’s a big hill, no doubt. I put down my head and pump my arms. I pass lots of people, so I know I’m strong. I harpoon the heartbreak right out of the hill, and crest it, sailing down the other side amidst a sea of cheers. Yo ho ho and thank you, Lord! Now it’s a short sprint to the finish. I blast by three runners right at the mats, and finish in 1:55:42. Not bad for an old salt like me! I head off to meet my teammates, swap stories, and munch on fish sandwiches and clam chowda. It’s seafaring fare, and no-one’s complaining- especially not me. As I head home, I thank my lucky stars I live in New England, with some of the best races and runners around. And I get to be part of it, whether I know it ahead of time or not.